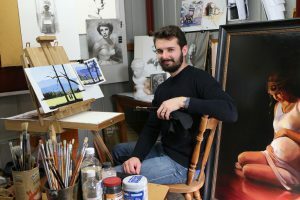 CANBERRA’S Daniel De Valentin is not about to give up his day job as an engineer, but if he did he reckons he would be an artist. The 25 year-old Canberran is more than handy when it comes to a paint brush. Recently the South Tuggeranong parishioner completed a mural commission for the Australian National University. He has had work exhibited in the National Portrait Gallery and held in several private collections. In September last year De Valentin was commissioned by Pierre and Ruth Fakhry to paint an image of ‘Our Lady Queen of Families’ for their ‘Hillview’ farm-stay chapel near Adelong and Tarcutta at the southern part of the Archdiocese. Mr De Valentin says he was grateful for the opportunity, noting the correspondence with well-known Sydney-based artist, Paul Newton, as being one of the highlights. “I got in touch with Paul for some advice on reference material for the painting,” he said. “Paul painted ‘Our Lady of the Southern Cross’ for World Youth Day in Sydney, 2008. The project took three months to complete. Mr De Valentin’s wife, Ruth, modelled for the artwork and was a huge support during the process. “My wife is very patient that’s for sure,” he said. In terms of materials, the work is oil paint on hand-stretched, Belgian linen. He uses a slow drying paint medium to extend the drying time of the oils, allowing him to work around a busy schedule. Originally from Griffith in the Riverina region of New South Wales, he began drawing and painting at the age of eight. Mr De Valentin considers his Grandfather’s woodturning as a main inspiration. “Nonno’s work on the lathe was impressive,” he said. “I think we grew up taking it for granted a bit.